World War I Collector - WW1/WW2 Memorabilia Collection - Beall, George O. Jr. This is an extensive group to a Marine pilot of WW2 who was shot down over Yap Island October 31, 1944. No trace of him was found until 1949 when missionaries discovered his grave on Yap. His body was exhumed and positively identified and at the request of his father, he was reinterred in Arlington Section 34, Lot 2767 on Grant Drive. This may be the most extensive Marine pilot KIA group existing today. 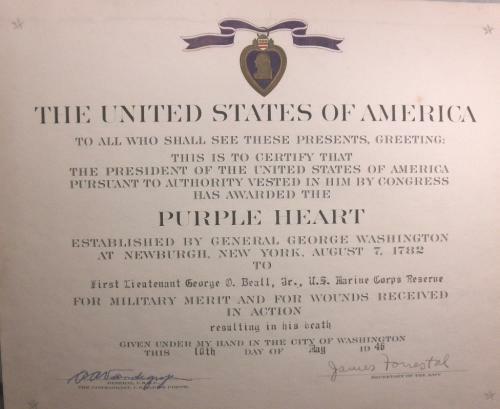 In addition to all his medals, there are 2 binders full of all his original paperwork, letters, telegrams, pictures, certificates, obviously kept by his family. As time permits, I will add lists of what is included. 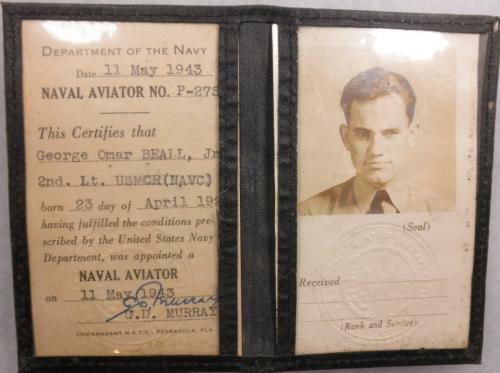 Included in the group is Beall's Naval Aviator diploma dated May 11, 1943, his USN Naval Aviator certificate with picture showing that he is Naval Aviator No. P-2757. 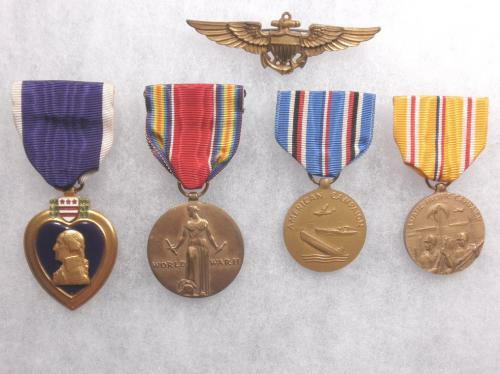 The hardware with the group includes his wings marked "Imperial", officially engraved posthumous Type 3 Purple Heart, Victory Medal, American Campaign Medal, and Asiatic Pacific Campaign Medal. The group includes period newspaper clippings, four different photos of Beall, including one in flight gear, a full page original color rendering of the VMF 121 patch, missing in action telegram to his parents, 13 original letters to his parents from HQ USMC regarding his loss in action, original Purple Heart certificate, and copies of the after action report during which Beall was lost over Tomil Airfield, Yap. And... his original birth certificate dated April 23, 1920, his high school diploma, and memorial service bulletin from the North Presyterian Church in Binghamton, NY. Quoting from that bulletin: "Lt George O. Beall, Jr., son of Mr. and Mrs. George Beall, was born April 23, 1920. he was graduated from Binghamton Central High School in 1937 and attended Maryville Collage in Tennessee for two years before entering the U.S. Marine Corps on June 26, 1942. George was attending Marysville College under the auspices Binghamtom Presbytery, in preparation for entering the ministry. He had been a leader in the North Presbyterian Church youth groups for many years. He was commissioned a second lieutenant in the Marine air corps on May 11, 1943 at Pensecola, Florida. A month later he married the former Ethel M. Manners of Long Branch, New Jersey. He was promoted to first lieutenant in October 1943. 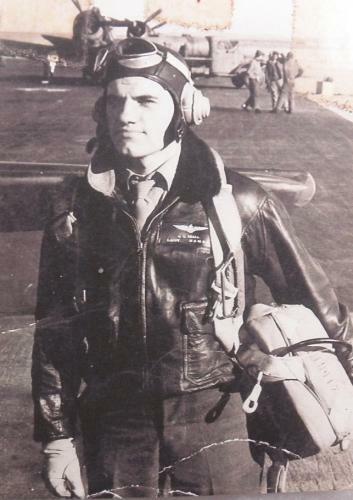 Lt. Beall was 24 when he was reported missing in action October 31, 1944 having failed to return from a mission against Yap in the Caroline Islands. His parents were officially informed of his failure to return in February, 1946. Besides his wife and parents, Lt. Beall is survived by his brother, Edward Beall." Note-the MIA telegram was dated November 6, 1944. The list goes on....All the official paperwork pertaining to Beall's application and acceptance and appointment as a flying cadet is included. 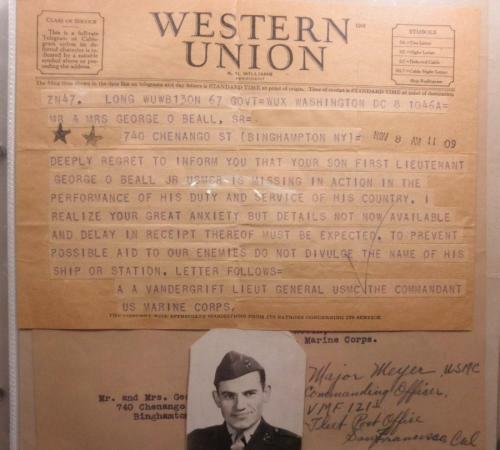 There are 70 original letters sent home by Beall to his parents and grandpearents between 1940 and 1943. A card accompany the group with Beall's printed name on it has a note attached saying that the card was on his casket at his burial in Arlington May 5, 1949. The book, Marine Fighting Squadron One-Twenty-One by Thomas Doll, published in 1996 has the following to say about Beall's loss: "The next day (October 31), the Squadron experienced its first loss of the Peleliu tour. 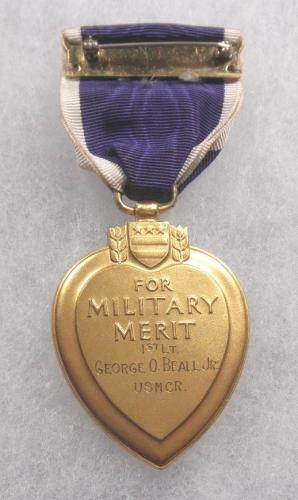 1st Lt. George O. Beall, the squadron's parachute officer, was part of Major William Clay Jr.'s 1240 flight on mission to bomb the Japanese airfield on Yap Island. After one of the dives, George Beall did not rejoin the formation. Major Clay circled the area of the Gagil-Tomil Airfield, searching for Beall or any sign of wreckage, but he could not locate him or find any evidence of his fate. The flight returned to base at 1645 and reported Beall missing." "Dear Mr. and Mrs Beall, I have regretted that in the past regulations have prohibited me from writing you except via Marine Corps headquarters and that even then I was allowed to give you no information. Now that regulations no longer apply I will gladly give you the most accurate picture possible. The mission assigned was to bomb one of the two airfields on the Jap held island of Yap. Flight of 12 planes (3 divisions, one of which was led by George) departed from the base on Peleliu and prior to the arrival at Yap assumed a formation which would allow us to make almost a simultaneous attack on the air strip in order to minimize our danger from anyi-aircraft fire--this was a dive bombing attack. As I remember it George was the 5th plane to dive and Lt. Perry, who dove right after George, saw George in the first part of his dive and then concentrated on his own target and saw him no more. The planes dove at 2 second intervals. As soon as we pulled out of the dive and started to rendezvous it was noticed that George was missing. A search revealed no trace of him. If he went in instead of recovering from his dive no one could tell because the entire length of the runway was erupting from bomb explosions. In that no one actually saw his plane, he had to be declared missing (regulations). It was generally assumed that he had been hit by anti-aircraft fire during the latter part of his dive and was unable to recover. I repeat, however, that this was only an assumption. I assure you that the entire area around the field was searched as closely as possible consistant with the enemy action and no trace of his plane was ever seen. I regret not being able to tell you more but there are many things in combat that one does not see. George was a great loss to all of us and his courage and skill as a pilot will be long remembered and admired. George was my favorite pilot among my favorite lieutenants because of his coolness and skill. In fact, he was the first lieutenant in the squadron to be given a division to lead (4 planes), and I wished that I had more like him. In spite of all his ability his manner was completely unassuming and that quality made him a favotite with everyone. Please accept my deepest sympathy, Sincerely yours, (signed) Walter J. Meyer" In the letter was a map that Meyer drew which showed the airfield and the attack pattern. 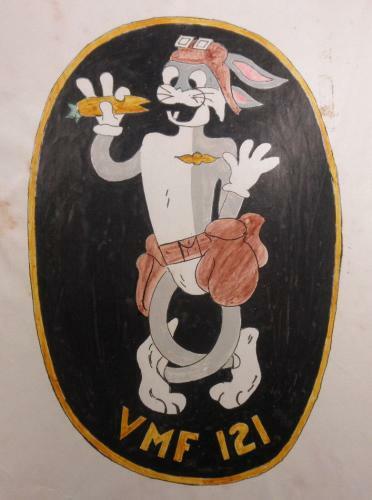 Included in the group is the attached VMF 121 squadron insignia that is an original color drawing on paper. It is about 7 inches high.